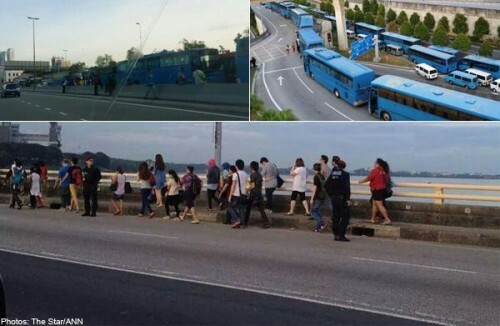 JOHOR BARU - Scores of Malaysian factory workers travelling to Singapore were forced to walk across the Causeway after factory buses refused to cross the checkpoint following the implementation of new toll charges Friday. Front office executive Adrian Dinesh, 30, said it looked as if a marathon was taking place along the Causeway. "Hundreds of workers were forced to walk and this is because the buses just did not want to go through," he said. He added that the groups of people started walking across the Causeway as early as 5am. Many have voiced dissatisfaction over the new toll charges, saying that the increase of more than 400 per cent was too steep. The Malaysian Highway Authority announced last week that from Aug 1, motorists travelling to Singapore via the Causeway must now pay a total of RM16.50 (S$6.45) for inbound and outbound toll charges at the Bangunan Sultan Iskandar Customs, Immigration and Quarantine (CIQ) Complex. A controversy erupted following the decision to impose toll collection at the CIQ as it forces those who do not use the Eastern Dispersal Link (EDL) but want to travel to Singapore to also pay the charges. The EDL is an elevated highway built to help disperse traffic heading into the Johor Baru city area. There are several exits from the EDL, with the last leading directly into the CIQ complex. Motorists using the elevated 8.6km highway are not tolled if they do not go through the CIQ complex. All charges must be paid electronically at both sides using Touch 'n' Go cards, with cash payments no longer possible. The new toll rates for vehicles coming into Malaysia are now RM9.70, RM14.70, RM19.70, RM4.80 and RM7.80 for the respective Class 1 to Class 5 vehicles. The previous inbound charges ranged from RM1.40 (for taxis) to RM6.10 (for vehicles with three or more axles). The new rates for outbound vehicles are RM6.80, RM10.20, RM13.60, RM3.40 and RM5.50. Motorcyclists are exempted from paying toll.